In August 2003, a group of Boston College students who had completed graduation requirements over the summer received their diplomas. On each one, as it had for generations, an eagle spread its majestic wingspan, and Latin script framed the classic Old English letters of the recipient's name. These diplomas were rich with history and tradition, but they also represented change. Until then, the name and degree on each Boston College diploma had been added by hand. For the past 40 years, the calligrapher was James Healy '59 of West Dennis, Massachusetts, who inherited the task from his father, Leonard '22, who himself devoted 38 years to the job. Some 140,000 diplomas passed under James Healy's pen, based on an estimate by the Office of Student Services, and they were always delivered on time. Only once, a few years ago, was there a close call—when Healy's house caught fire two days before Commencement. He was on the way to Boston College when it happened, the thousands of completed diplomas safe in his car. Staff at BC proofread Healy's work, but very rarely found an error. "There's a touch of the perfectionist about him," says University Secretary Joseph Duffy, SJ. "You're not going to find too many people like Jim who'd put that amount of time into such a labor-intensive activity." Over the last year or so, BC administrators researched laser-printing the diplomas in-house, a process to which many universities have already switched. Director of Student Services Louise Lonabocker says a newly truncated Senior Week lent urgency to the decision. As of 2004, there will be seven rather than 10 days between exams and Commencement. Once final grades are in, almost a third of the diplomas must be topped off with a "summa" or "magna." For a laser printer, at 300 sheets per hour—roughly 15 times the rate possible by hand—a tight turnaround poses no problem. Though cost was not the reason BC turned to laser inscription, the monetary savings are significant. Lonabocker estimates laser printing could save the University $50,000 per year. To accommodate the new machinery, the diploma's dimensions were reduced from 15 by 19 inches to 13 by 16. Paper enthusiasts may note that the 67-pound parchment with supercalendared finish (ivory) was switched to 65-pound opaque offset cover vellum (still ivory). The plates used to print the graphic elements had worn down over the years, so an artist touched up details of the eagle and University seal. So far, Student Services has received only positive feedback, and the August and December graduations went smoothly. "The big test is going to be in May," says Lonabocker. The fact is that much like the institutions with which they're linked, diplomas vary with history and place. Modern Ukrainian universities issue diplomas on small, laminated cards. Amherst College offers the now-rare sheepskin, and a vegetarian alternative. For advanced degrees, the Colorado School of Mines confers a sheet of sterling silver. The word "diploma" itself traces etymologically to the Greek root "folded," as in what the ancients did with important papers—and what today's American universities would hardly consider doing to a crisp new certificate. 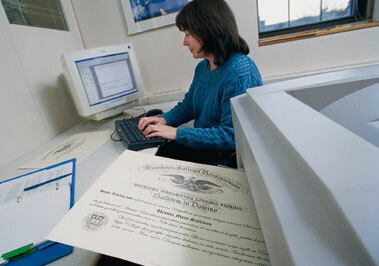 The history of Boston College's own diploma is one of subtle changes. Over the 20th century, graduates' names went from Latin aliases ("Henricum Aloisium Callahan") to plain English; a Jesuit seal glued over maroon and gold ribbons evolved into the printed Boston College seal; the banner clamped in the eagle's beak once read "Ad Majorem Dei Gloriam" ("For the Greater Glory of God"), then "Ever to Excel," before bearing as it does today the Greek translation of that Homeric motto. James Healy recalls that the diplomas his father lettered for the duration of World War II were smaller in size, to conserve paper. Until the 1990s, he himself had to correct by hand the Latin case endings on each female graduate's diploma—with a small inked loop, changing "probatum" to "probatam." At his retirement luncheon in August, Healy was presented with a cherrywood captain's chair stamped with the University seal and the words "James F. Healy '59, With Grateful Appreciation."